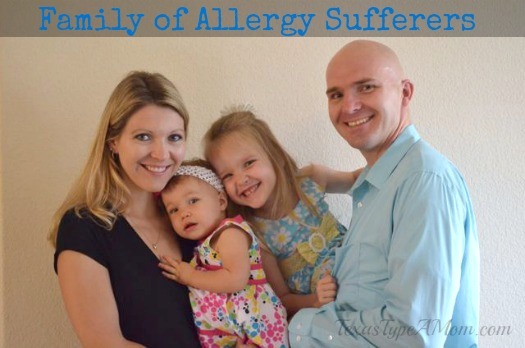 We’ve called Texas home now for almost four years and before that our allergy symptoms were pretty minimal. Since moving here though, we’re all experiencing the not so joyous moments that accompany living in such a beautiful, temperament climate. I’ve learned that a mild climate means that something is always in bloom and extended relief from allergies just isn’t possible. At least not witha little help. And allergies don’t just affect people. 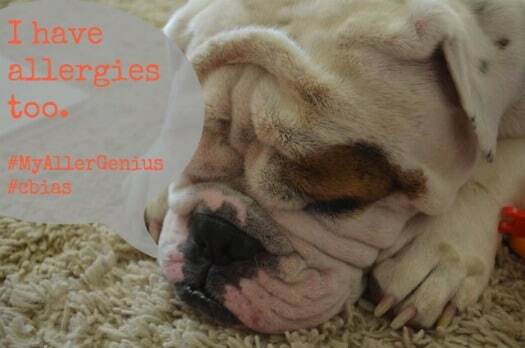 Allergies are ruthless and effect everyone – our poor bulldog is sensitive to environmental allergens and has to be given allergy medications daily as well. Our allergy fighting kit has grown and changed over the years and there’s a little something in here for each member of the family. We have pills, sprays, drops, and syrups. Yes, there’s even medication for our dog. 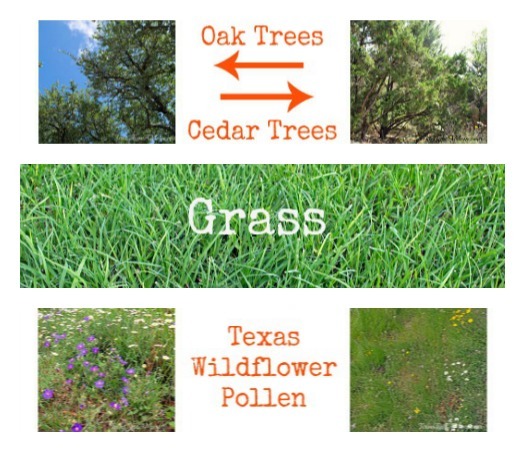 What kind of allergens are we up against in the Austin area? In addition to typical allergens like grass and ragweed, we also have something blooming pretty much year round. Unfortunately our backyard is full of trees and native Texas wildflowers and while they’re beautiful, they only add to the misery sometimes. At certain times throughout the year we’re all sniffing, sneezing, and just feeling downright miserable. I try to tough it out but this just makes me feel worse. And with an already short supply of energy, I can’t take just anything because it will zap the little bit of energy I do have. That’s why I’m so excited to try out Allegra. I’ve been hearing great things about it but with a warehouse club supply of allergy medicine already, I haven’t wanted to make the leap. While my previous medication wasn’t perfect, it did provide a little relief and the sinus pressure wasn’t nearly as frequent as it was before I took it. But two days ago, I finally made the switch to Allegra. I’m only on day two of my new allergy regimen but so far I haven’t had any problems. I haven’t had any headaches or a lack of energy and that’s huge progress for me. I’ve learned from taking medications it’s always worth checking out a brand’s site before purchasing because often times there are coupons for money off, even for prescriptions. As luck would have it, MyAllergenius did alert me to a deal happening right now that I could take advantage of. Now through 5/31 CVS card holders can enjoy special savings of $6 off the 45 pack of children’s is $9.99. While I was on MyAllergenius, I signed up for the daily email alerts (text updates are also available) to stay up to date on the pollen levels in my area. I’m so excited to feel relief from my allergy symptoms and know my family members can all find relief as well. 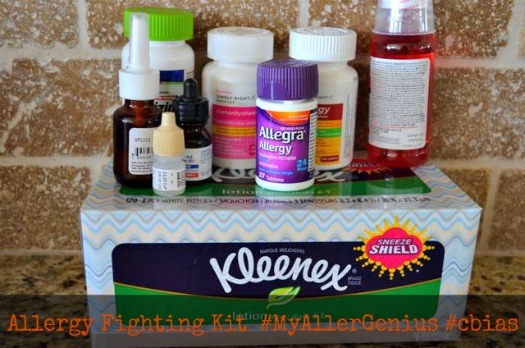 No more fear of spending too much time outside or allergies that get out of hand and morph into sinus infections. Aww, even your poor doggy! 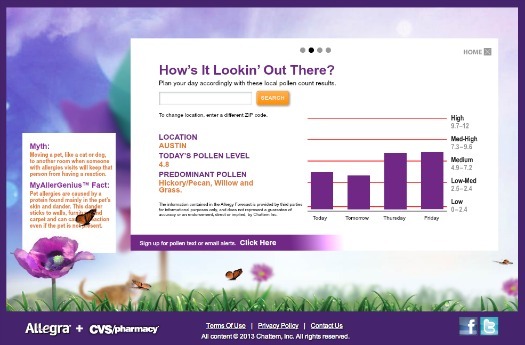 We have such bad pollen here in NC–it’s so tough for people who have allergies! I am a wicked allergy sufferer. Thankfully my kids have never really had to deal with it & I am hoping at this point, they don’t. It’s hard to really find relief. Allegra works really well for us. &Your poor pup! 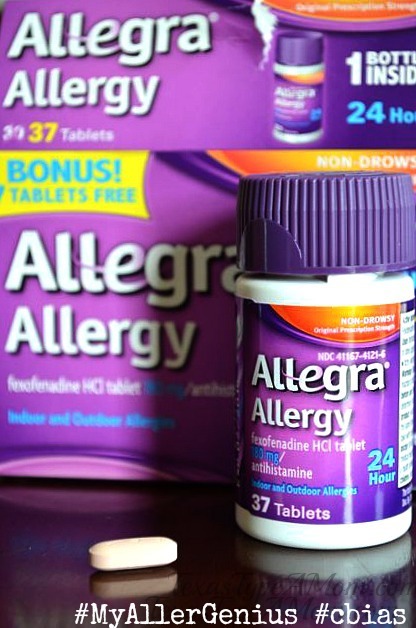 I forgot to take my Allegra this morning and my eyes were watering all afternoon! OH!! Your dog is ADORABLE!!! My youngest baby has crazy allergies. He takes 24-hour allergy medicine every night before bed. My husband suffers from allergies being horrible right now from fresh cut grass. Though we love the smell now that our weather is nice, my husband pays the price. Allegra helps him though!